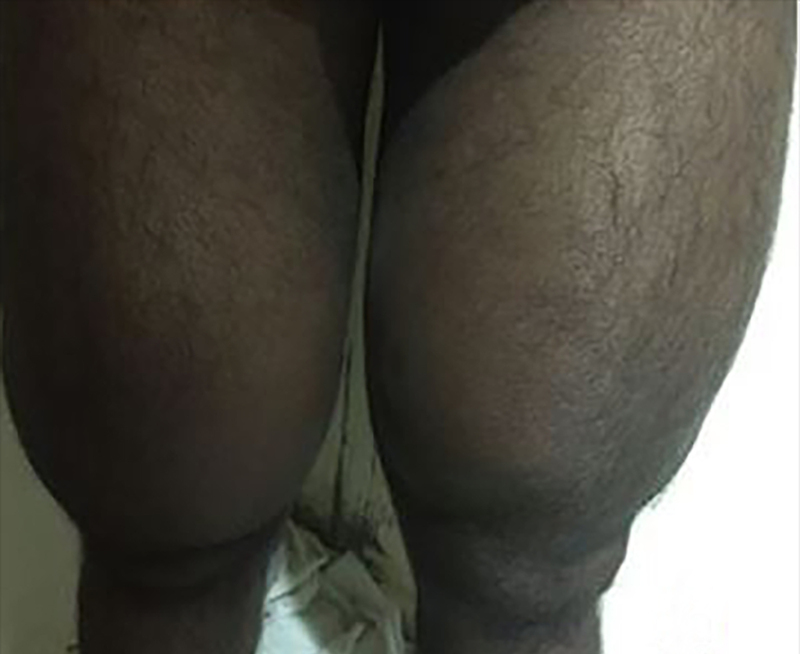 A 28-year-old male presented to the orthopedic outpatient department with a three-year history of painless swelling in bilateral thighs and knees. 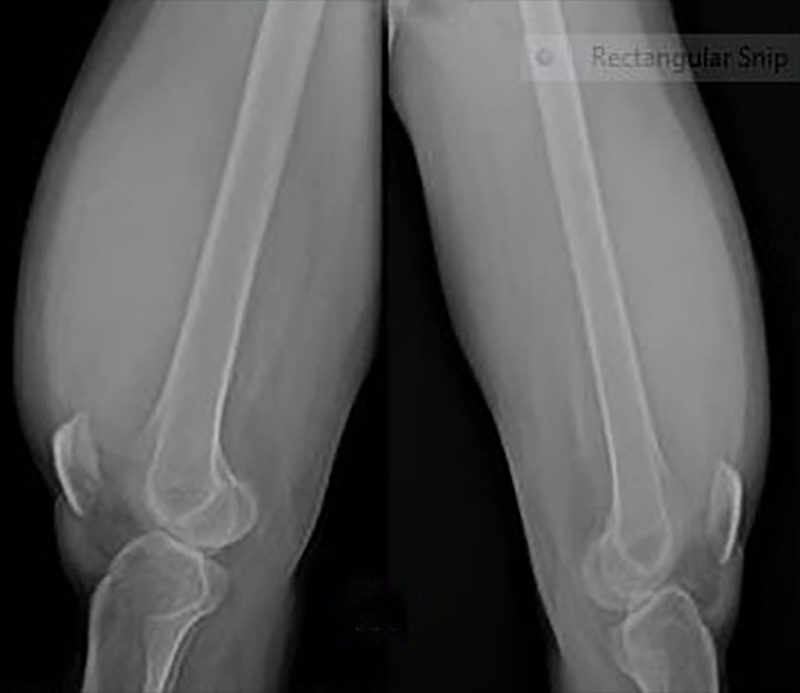 He gave history of exacerbations and remission of the swelling and repeated knee joint aspiration for symptomatic relief, which revealed clear fluid. There was also history of dull pain in the left hip joint for which he had not taken medical advice. The general physical examination revealed no significant abnormality. Local examination revealed swelling of bilateral suprapatellar region and knee joints (Figure 1A).There were no signs of acute inflammation. Fluctuation and patellar tap tests were positive on both sides. His laboratory tests complete blood count, HIV, HBsAg, C-reactive protein, ESR were normal. Rheumatoid factor was negative. The patient was referred to the radiology department for bilateral knee joint and hip radiography. 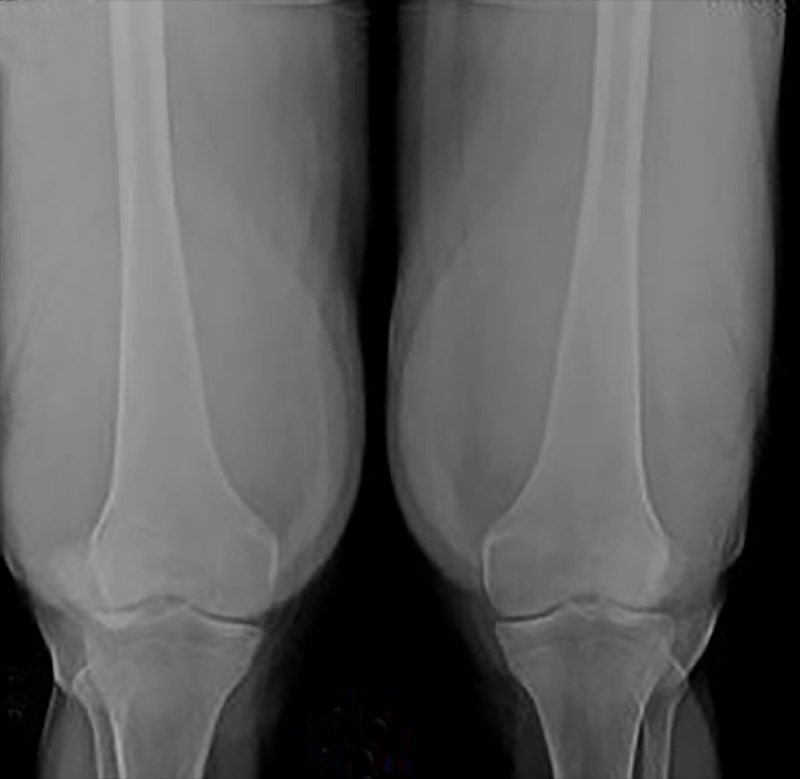 Radiography of both knee joints AP and lateral view (Figure 1B and 1C) revealed soft tissue swelling in the suprapatellar region. There were no bone erosions. 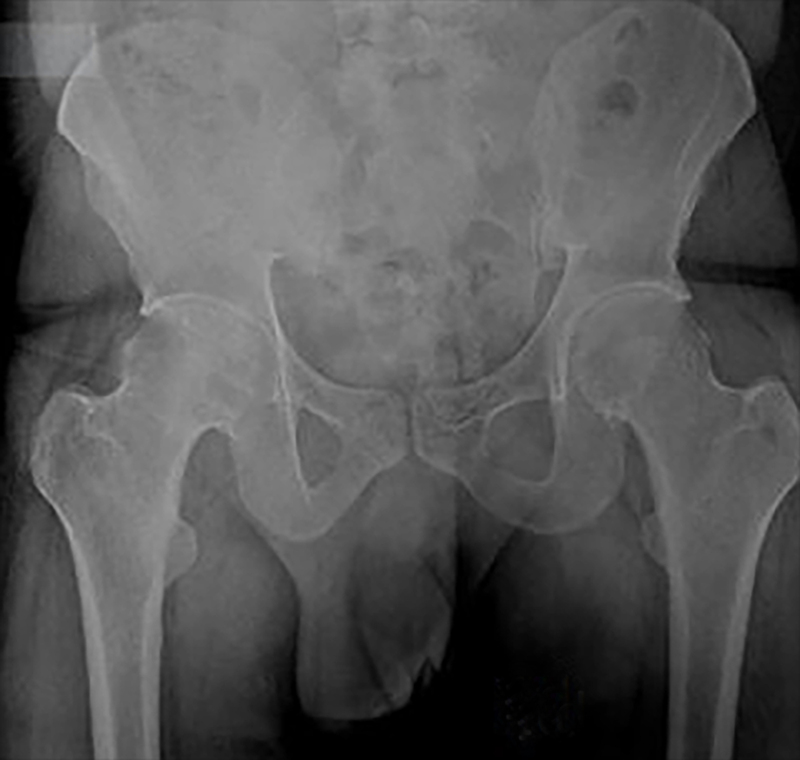 Radiography of both hip joints with pelvis (Figure 1D) revealed displacement of fat stripes along the left hip joint, s/o possibly left hip joint effusion. Visualized bones were normal. Patient was then referred for further evaluation by ultrasound of both knees and MRI of both the knees and hips for further evaluation. Ultrasound of the knee (Figure 2A and 2B) was performed by high frequency linear probe, which revealed bilateral knee joint effusion with collection in the suprapatellar region. There was frond-like hyper echoic synovial growth, which was seen projecting into the collection. 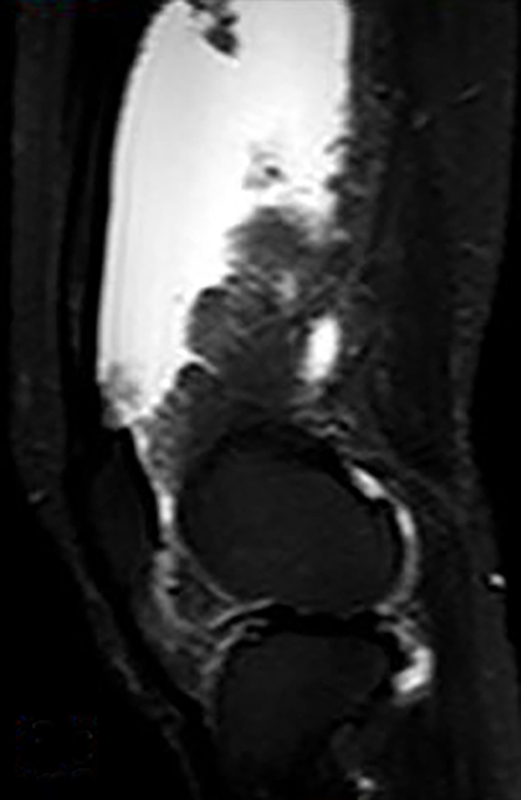 MRI of the knee and hip joints was performed using dedicated knee coil on 1.5 Tesla Philips MR Achieva, which revealed frond-like villous proliferation of the synovium in bilateral knee joint and suprapatellar compartment, which showed fatty signal on T1W (Figure 3A) and T2W image (Figure 3B) .There was complete loss of fatty signal from the villous projections on fat suppressed STIR images (Figure 3C and 3D). There was associated large collection in bilateral suprapatellar compartment with mild collection in bilateral patello-femoral and tibio-femoral compartment. A diagnosis of lipoma arborescence of bilateral knee joint and suprapatellar compartment was made based on classical imaging findings of fat signal intensity frond-like synovial proliferation with associated effusion. 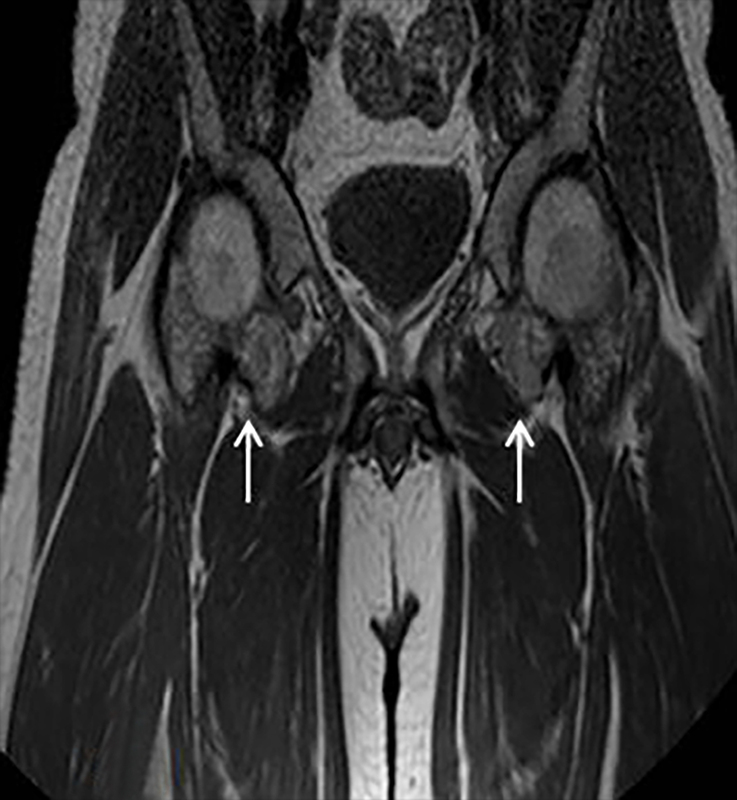 MRI of both hip joints revealed similar lipomatous synovial proliferation with mild joint effusion on both sides (Figure 4A and 4B). Patient underwent excision of the lipomatous growth with synovectomy of the right knee followed by left with relief of his symptoms. 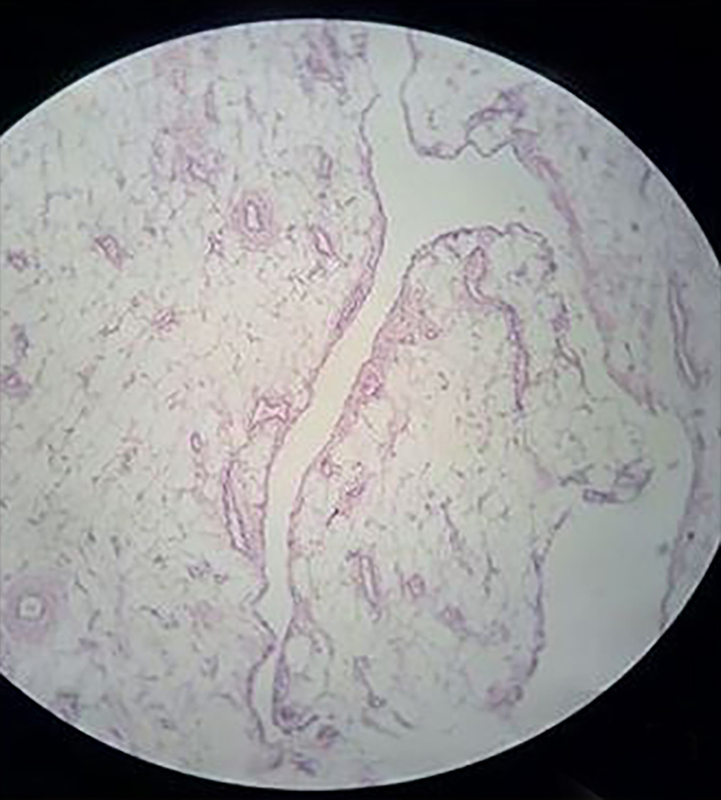 Specimen was sent for histopathological examination, which revealed villous projections lined by synovial epithelium with sub epithelial tissue comprised of predominantly fat, intervening blood vessels and chronic inflammatory infiltrate of histiocytes, plasma cells and lymphocytes. 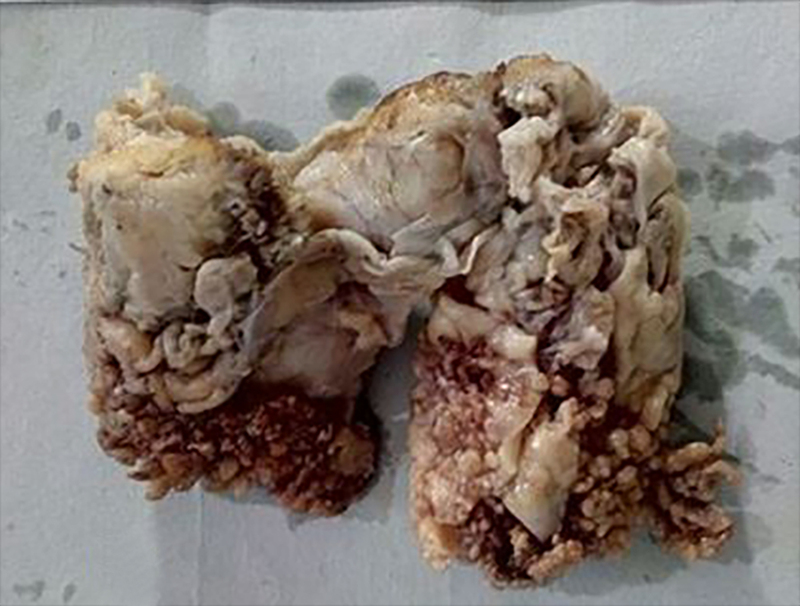 Gross pathological and histopathological findings were consistent with diagnosis of lipoma arborescence (Figure 5A and 5B). The Latin term “arborescence” (tree forming or tree-like) was given by Hoffa as the frond-like appearance of the synovium resembling a leaf in a tree. Radiologically, X-ray will demonstrate soft tissue swelling in the suprapatellar pouch with or without osteoarthritic changes. The soft-tissue swelling is predominantly due to the presence of effusion. Underlying fatty synovial proliferation giving lucencies may be obscured in most of the cases.9 In our case, the patient had soft-tissue swelling in bilateral suprapatellar region. 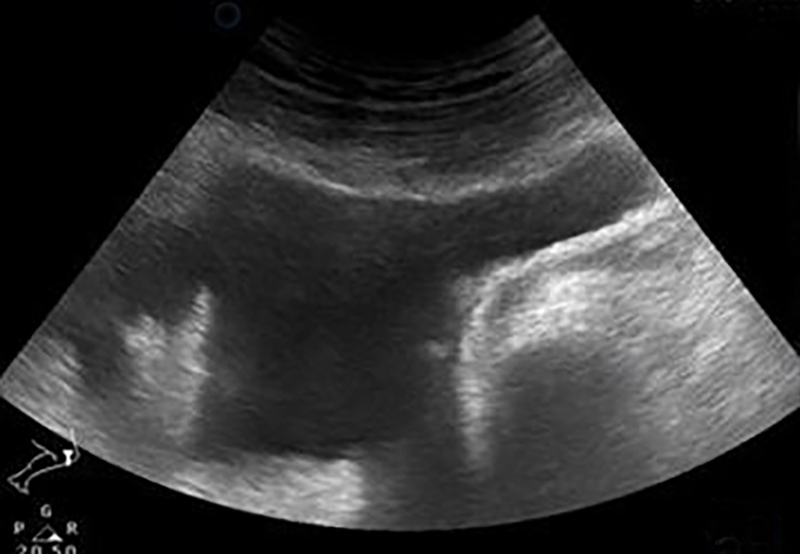 High-resolution ultrasound findings include uniformly hyperechoic synovium based mass located in the suprapatellar bursa. Multiple finger-like globular and villous fronds can be seen extending from the base of the mass. Large anechoic effusions can be demonstrated in all patients. On color Doppler, no significant vascularity is seen. Dynamic compression of the villi demonstrates pliable nature of the villi.10 Similar findings were noted in our case. On MRI the characteristic appearances are multiple frond-like synovial proliferation of fat signal intensity and suppression of signal with fat selective presaturation. 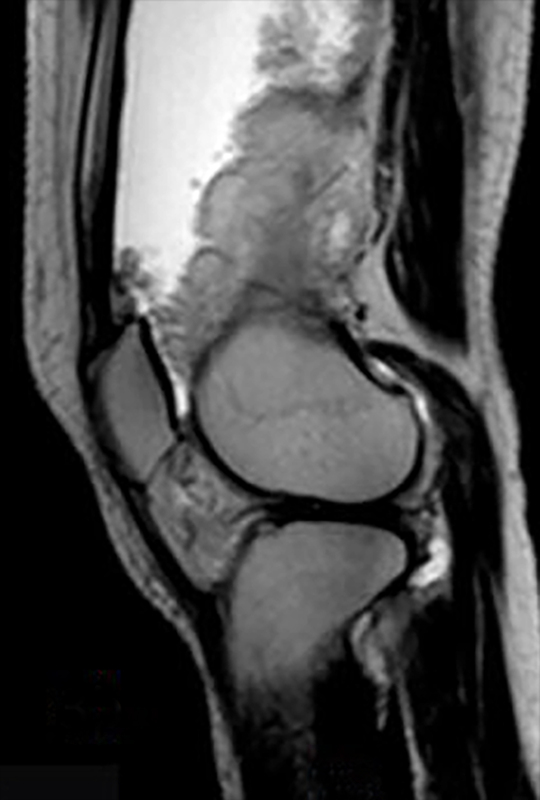 Other ancillary findings are associated joint effusion, potential chemical shift artifact and absence of magnetic susceptibility artifacts from hemosiderin.7 Our case showed the characteristic finding of lipoma arborescence on MRI in both the suprapatellar pouches and in bilateral hip joints. Lipoma arborescence should be considered in the differential diagnosis of recurrent unexplained knee and suprapatellar swelling in a young patient. 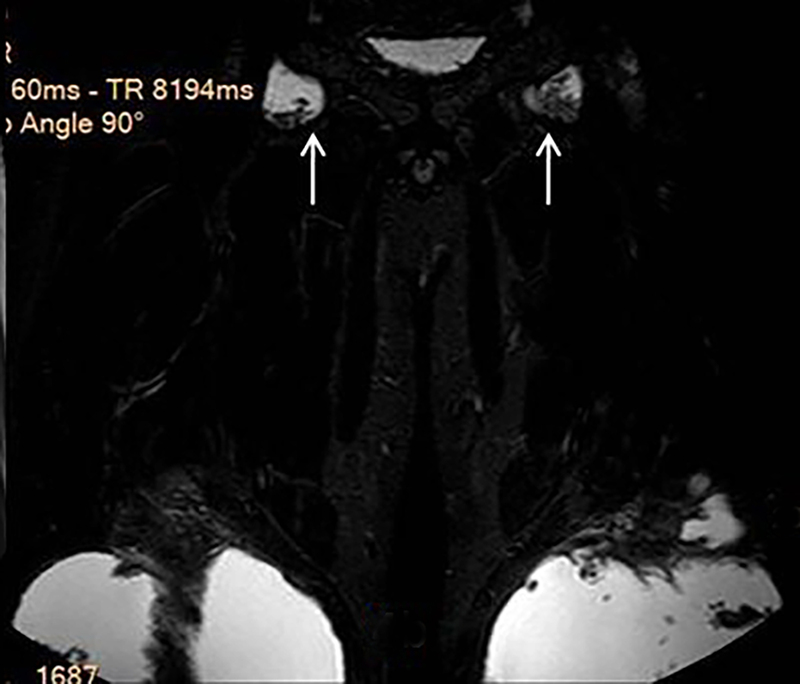 MRI is the modality of choice for this condition, which shows its characteristic imaging features and helps in ruling out the differential diagnosis. Since multiple joints can be involved screening of the other joints should be done for early diagnosis and management. Ryu KN, Jaovisidha S, Schweitzer M, et al. MR imaging of lipoma arborescence of the knee joint. AJR American Journal of Roentgenology.1996 Nov;167(5):1229-1232. Liddle A, Spicer DDM, SomashekarN, et al. Lipoma arborescens of both knee: case report and literature review. J Orthopaedic Case Reports. 2012 July-Sep;2(3):3-7. Saglik Y, Akmese R, Yildiz Y, et al. Lipoma arborescens occurring in both knees at different times: a case report. ActaOrthopTraumatolTurc. 2006;40:176-180. Santiago M, Passos AS, Medeiros AF, et al. Polyarticular lipoma arborescens with inflammatory synovitis. J Clin Rheumatol. 2009;15:306-308. Babar SA, Sandison A, Mitchell AW. Synovial and tenosynovial lipoma arborescence of the ankle in an adult: A case report. Skeletal Radiol. 2008;37:75-77. Kloen P, Keel SB, Chandler Suggested histopathological correlation, et al. Lipoma arborescence of the knee. J Bone Joint Surg Br.1998; 80:298-301. Feller JF, Rishi M, Hughes EC. Lipoma arborescence of the knee: MR demonstration. Am J Roentgenol. 1994;163(1):162-164. Yah CH, Wong JWK, Yip DKH. 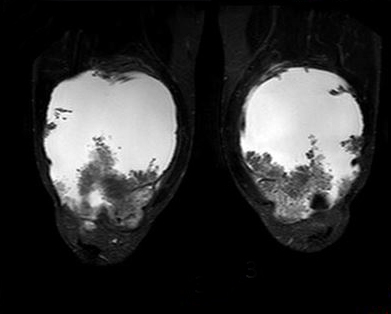 Bilateral knee lipoma arborescence: a case report. Journal of Orthopaedic Surgery. 2008;16(1):107-110. Feller JF, Rishi M, Hughes EC. Lipoma arborescence of the knee: MR demonstration. Am J Roentgenol. 1994;163:162-164. 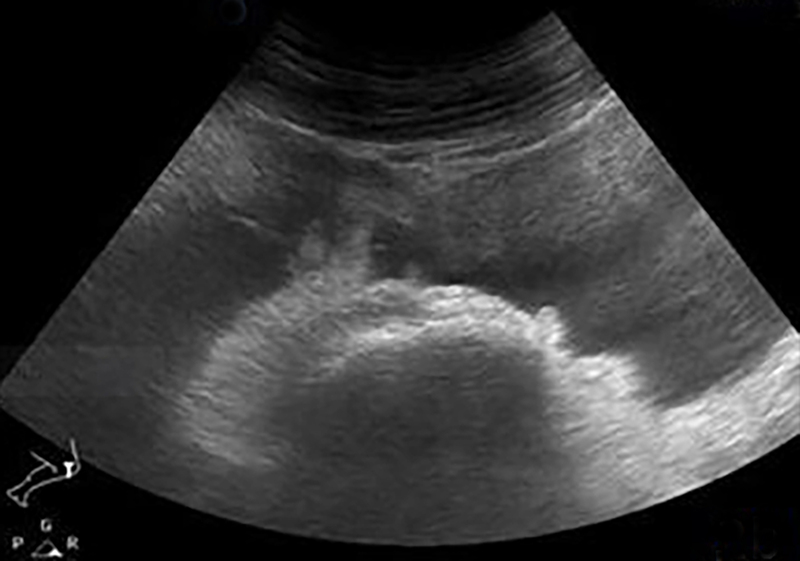 Learch TJ, Braaton M. Lipoma arborescence: high-resolution ultrasonographic findings. Journal of Ultrasound in Medicine. 2000 Jun 1;19(6):385-389. Narvaez JA, Narvaez J, Ortega R, et al. 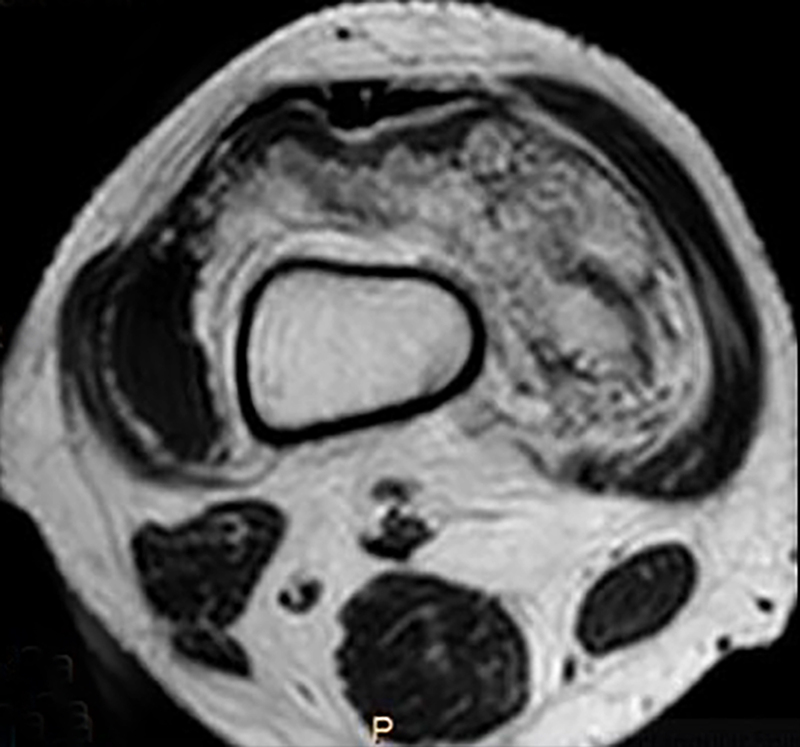 Hypointense synovial lesions on T2-weighted images: differential diagnosis with pathologic correlation. AJR Am J Roentgenol. 2003; 181:761-769. Dorwart RH, Genant HK, Johnston WH, et al. Pigmented villonodular synovitis of synovial joints: clinical, pathologic, and radiologic features. AJR Am J Roentgenol. 1984;143:877-885. Greenspan A, Azouz EM, Matthews J, et al. Synovial hemangioma: imaging features in eight histologically proven cases, review of the literature, and differential diagnosis. Skeletal Radiol. 1995;24:583-590. Umredkar AB, Disawal A, Anand A, Gaur P, Kaur J. Bilateral synchronous involvement of knee and hip joints with primary lipoma arborescence in a young male. Appl Radiol. 2017;46(10):24-28. Prepared by Dr. Umredkar while an Assistant Professor, Dr. Disawal while an Associate Professor, Dr. Taori while Head of Department, Dr. Anand while a Professor, Dr. Gaur while an Associate Professor, and Dr. Kaur while a Resident at the Government Medical College in Nagpur, India.